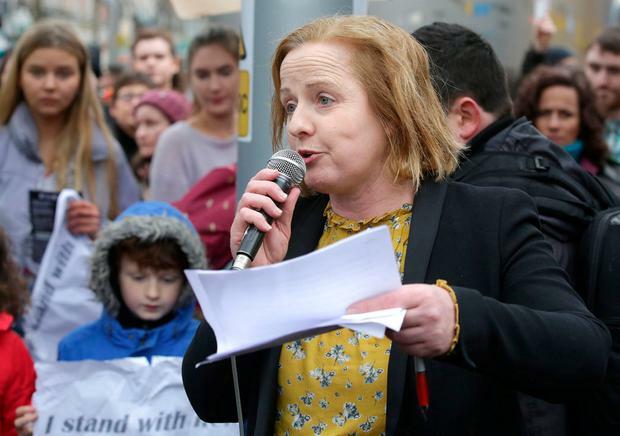 Solidarity TD Ruth Coppinger has slammed Taoiseach Leo Varadkar's description of the Repeal movement as a "quiet revolution". The politician, who campaigned for years to repeal the Eighth Amendment, also accused the mainstream media of "facilitating a rewriting of history". Mr Varadkar, who appeared on stage at Dublin Castle with Health Minister Simon Harris, said the result of the referendum was "the culmination of a quiet revolution that's been taking place in Ireland over the past 20 years". Ms Coppinger said the victory was anything but quiet. "For thousands of activists, it's been a noisy battle cry for over five years since the tragic death of Savita, with the establishment turning a deaf ear to demands for a referendum," she said. "The countless marches which took place were told by most of the politicians who strode the Dublin Castle stage there was no appetite for change." She said that in the Dáil the only reflection of the grassroots movement was the left parties which were now being "written out of the script", pointing out the Socialist Party first published a bill to repeal the Eighth in September 2014 and in October 2016 which was voted down but "embarrassed the Government hugely and precipitated the setting up of the Citizens' Assembly". Meanwhile, Children's Minister Katherine Zappone said that following on from their role in the marriage equality and abortion referendums, young LGBTI people will be at the forefront of the next great social change. Speaking at the launch of the Belong To annual report for 2017, Ms Zappone told the young audience in Dublin: "It was yourselves and others who are part of the community who led us to those victories." She cited the 87pc of 18-24 year olds who voted Yes in the referendum last week: "My people, the LGBTI community, especially the young people, will be at the forefront of the next social change."